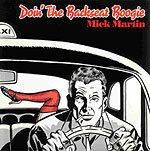 CD review: "Doin' the Backseat Boogie"
White bluesman Mick Martin turns in a solid, workmanlike set of boogie and blues shuffles on this independent release. A fiery harp player and gruff vocalist, Martin's version of blues has a Midwestern feel to it, belying his West Coast location. In addition to singing and playing harmonica, Martin also wrote or co-wrote all the cuts on this album. Most are solid, muscular straight-ahead blues and blues-rock, and none is what might be called a dog. To be sure, Martin is still a club performer, not ready for the national scene. But "Doin' the Backseat Boogie" is a notch above most releases by regional artists, and is a very listenable album.